My Newly Discovered Asheville ROOTS! I have been researching my family’s history for over thirty years, but it wasn’t until two weeks ago that I discovered a family history connection to Asheville. My maiden name is Gwyn, and my earliest known direct paternal ancestor was a man named Melon Gwyn. He was born in about 1850 in Surry County, NC, a likely slave of the Gwyn family. The earliest record I have found of him was from his marriage in 1873 to Martha Headspeth, whose parents Richard Headspeth and Lucy Fowler were both free as early as 1840. Melon’s mother’s name was listed as Sela or Cila Gwyn, and his father’s name was left blank, which in my experience with other family members from this period often means that the father was a white man known to the family, but left unidentified publicly. Rachel Porter Songer, born into slavery, the daughter of slaves. She was the half sister of my GGG Grandmother, Phoebe Porter Sales. Back to Melon… I also had made assumptions about his slave holding family and his parents. Although I do not have a photo of Melon, I have several photos of Melon’s son James, (my great grandfather.) I believe it is very likely that Melon’s father was a white man. This is a photo of two of Melon’s sons, James and his unidentified brother. I long suspected that Melon’s father might have been James Gwyn, part of a large family of Gwyns in Virginia, North Carolina & Tennessee who owned hundreds of slaves between them. Research into slaveholder James Gwyn’s family revealed names that were also part of my own family: James Gwyn has brothers named Hugh and Richard, and a son named Walter. Melon Gwyn named his eldest son Hugh Richard, and two other sons Walter and James. I was able to read James Gwyn’s plantation diary and many family papers of his because they were donated to the UNC Chapel Hill library. He permitted his slaves to be baptized and married, and while he wrote about them in a very paternalistic way, nothing I read gave me a notion about him fathering children among them. Of course, I can’t imagine that is something a slave owner would write about… In the end, however, DNA testing might have answered that question for me. None of our DNA matches has the name Gwyn in their family trees, but several have the names Martin and Dowell, two families living nearby and very closely associated with James Gwyn’s family. My new find in Asheville, however, has given me more reasons to suspect a very close relationship between James Gwyn’s family and Melon’s family. I was never able to find reference to Melon or his mother Sela in any of James Gwyn’s family papers or in any other written record until his marriage in 1873 in Surry County, NC. In 1880, Melon lived with his wife Martha and their four sons in Watauga Township, NC. He worked as a farmer and both he and his wife were able to read and write. In 1900, he and Mattie are listed with their ten children in Cranberry, Mitchell Co., NC. He worked as a day laborer and owned his home free (no mortgage payment). 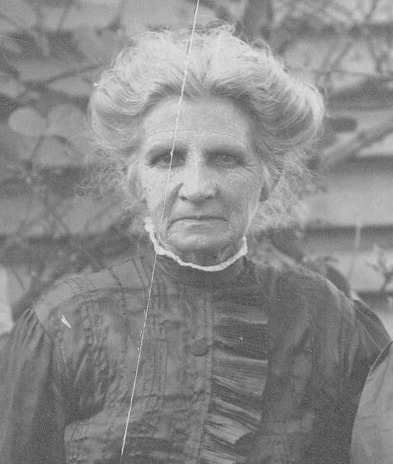 In 1910, Martha is listed as a widow and she and her children were living in Pittsburgh, PA. I recently learned that two of her sons died that year, Edward on April 10th and Charlie less than two weeks later on the day of the census, April 26, 1910, both of pneumonia. Melon’s history after 1900 and the date of his death were a mystery to me. Then, two weeks ago, while searching Ancestry.com, a search result came up for Melon Gwyn in the 1904 Asheville City Directory. After over twenty years, the shock of finding him here in Asheville still hasn’t worn off! Also listed on the page were three of his sons: Edward, Richard and Walter. A few days after making this discovery, I was able to find two newspaper articles referencing Melon. Walter B. Gwyn was the son of the slaveholder James Gwyn. Melon arrived here in Asheville shortly after Walter came here. I learned from Walter Gwyn’s papers that he was also in Blowing Rock at the time the Melon was hired at the restaurant. Of course, these might be just coincidences, but at this point I’m having trouble believing in coincidences. A correction in the back of the city directory says that 9 Eagle St. should be listed as 10 Eagle Street. 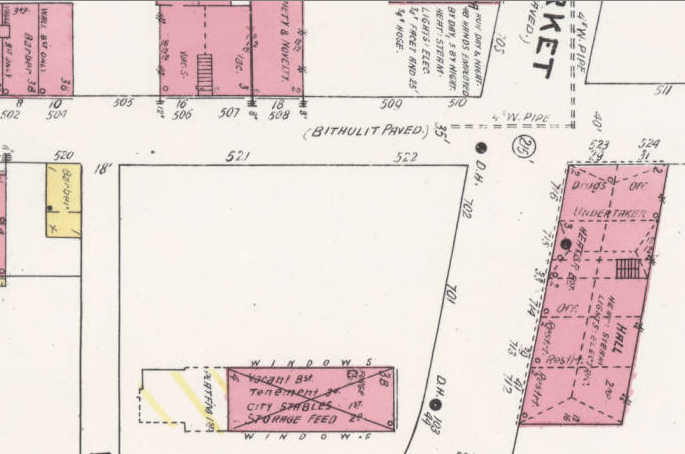 A detail of the 1907 Sanborn Fire map shows 10 Eagle second from the top left (YMI is the building in the bottom right. 8 Eagle St was a barber shop, and today is the location for Smooth’s DO Drop In barbershop. Below is the location as it appeared in the 1950’s. Melon’s restaurant would have been to the right of the Billiards sign. This discovery has given me a new sense of connection to Asheville. I think of my work in studying the history of the Eagle & Market Street business district, and in helping to promote Asheville’s locally owned black businesses and I have to think Melon Gwyn would have been proud and truly amazed at the path that led me to this place. I’m so grateful to call Asheville home, and now part of me feels that all along Asheville was calling me home. This entry was posted in Asheville Black Business, History on December 15, 2014 by Sasha Mitchell. Do you want free advice about caring for a treasured heirloom, such as a quilt, a china bowl or a family photo? If so, bring your item to Conservation Assistance Day at the Western Office of Archives and History on 176 Riceville Road in Asheville. Conservators from the N.C. Museum of History and an archivist from the N.C. Department of Cultural Resources Western Regional Archives will give you expert advice on Friday, July 18, from 9 a.m. to 4 p.m. You are invited to bring up to three objects for assessment. An appointment is required, so please call Lorraine at 828-296-7230, ext. 221, to reserve your time slot. Conservation Assistance Day is organized by the N.C. Museum of History and the Western Office of Archives and History. For information about the N.C. Museum of History, a Smithsonian-affiliated museum, in Raleigh, call 919-807-7900 or access www.ncmuseumofhistory.org or follow on Facebook, Twitter, Instagram, Google+ or YouTube. This entry was posted in Community, History on July 18, 2014 by Sasha Mitchell. Stephens Lee is hosting their Alumni Reunion this weekend! This reunion is open to all alumni as well as friends in the community who gather to remember those who have passed on, embrace those who have returned, and celebrate the glorious history of Stephens Lee High school and all that it represents. All proceeds from the reunion benefit the Stephens-Lee Alumni Scholarship, available to descendants of Stephens-Lee Alumni with a 2.5 GPA or higher for use towards a two or four year degree. This entry was posted in Community, History on July 1, 2014 by Sasha Mitchell. 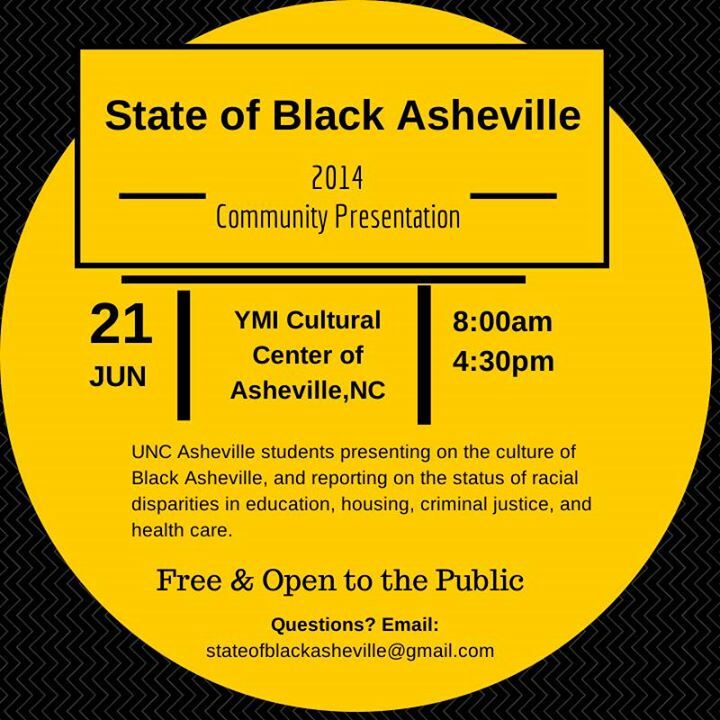 UNC Asheville students from the State of Black Asheville course will present their research on the status of Black Asheville in several public policy areas such as : education, health care, housing & economic development, criminal justice, and culture. This entry was posted in Community, Events, History on June 3, 2014 by Sasha Mitchell. Join Michelle Lanier, Director of the North Carolina African American Heritage Commission with the Gathering Place Project as she discusses how to use oral histories for sharing and preserving your institution’s message and history. The Gathering Place Project will offer 6 statewide workshops this year that focus on the three main challenges that face our African American Museums and heritage practitioners: preservation, sharing, research. Participants will hear success stories, best practices, and learn about available resources. Please find your registration form here. This entry was posted in Community, History on March 28, 2014 by Sasha Mitchell. Burton Street Neighborhood needs to be heard! 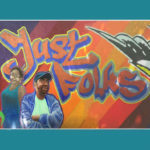 Please read this story by David Forbes in Mountain Express about the impact of the I-26 Connector on the Burton Street Community. How many times does the Burton Street community have to bear this burden? When you look at the overview map of changes to I-26, “The Big Picture”, try zooming in on the homes slated for demolition, the neighborhood to be divided again. (You can zoom in on the photo above by clicking on it and then pressing ⌘= on a Mac or CTRL+ on a Windows computer) Asheville has had a long history of hurting African American neighborhoods in the name of “progress”. Please stand with this community! 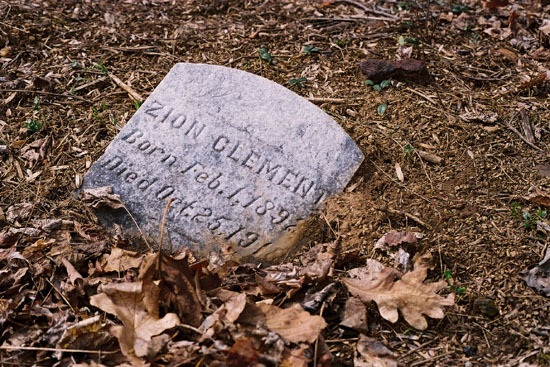 Among the items in Special Collections at D. Hiden Ramsey Library at the Unviersity of North Carolina at Asheville is an oral history collection about the South Asheville Colored Cemetery. Interviews with elderly African American natives of Asheville, NC, give a vivid record of rites of death and burial for black residents of Asheville before 1940. Collection includes: Interviews with nine African American residents of Asheville, NC with knowledge of persons buried in the South Asheville Colored Cemetery ; A partial listing from the Buncombe County Death Registry of persons buried in South Asheville Colored Cemetery ; A list of artifacts related to burials in the cemetery and sources for further information about the cemetery ; An article: “The South Asheville Colored Cemetery 1840-1943,” by Wilburn Hayden, Jr. Please visit their site and learn about this historic site in our community. When paper records are damaged or nonexistent, sometimes a headstone might bear the only written proof of an ancestor’s existence. In any case, cemeteries are sacred places, and without regular care and maintenance, they are soon overtaken by the growth of vegetation. I am grateful to know that this cemetery is going to be receiving some much needed attention and research expertise to help map it, clean it up, repair broken stones. Although many names are lost to history, an effort is being made to record more of the names of those buried there, both in marked and unmarked graves, and to re-connect those ancestors to their families in our community today. This entry was posted in Community, History on February 24, 2014 by Sasha Mitchell. Rich Mathews, historian and researcher for Mathews Architecture, will present a slide presentation about the Southside Neighborhood in Asheville. Read more about it at the North Carolina Room blog, HeardTell. This entry was posted in Events, History on February 24, 2014 by Sasha Mitchell. After being denied education for so long, upon emancipation freedman embraced every opportunity to learn. Those who could read taught others. Churches housed schools. And around the country, HBCU began to form. After the second Morrill Act of 1890 was passed, states that excluded black students from their land grant colleges were required to establish separate land grant colleges for them. I was asked to make a presentation to the group about the history of YMI. I was thrilled to be able to share my knowledge of some of the founders and leaders of YMI and Asheville’s black community, and how HBCU influenced the course of their lives. In YMI’s history, William Trent and Dr. J. W. Walker were both graduates of Livingstone College who were instrumental in YMI’s early days. Dr. Walker received his medical degree from Leonard Medical School of Shaw University. Mr. Trent later became president of Livingstone College. 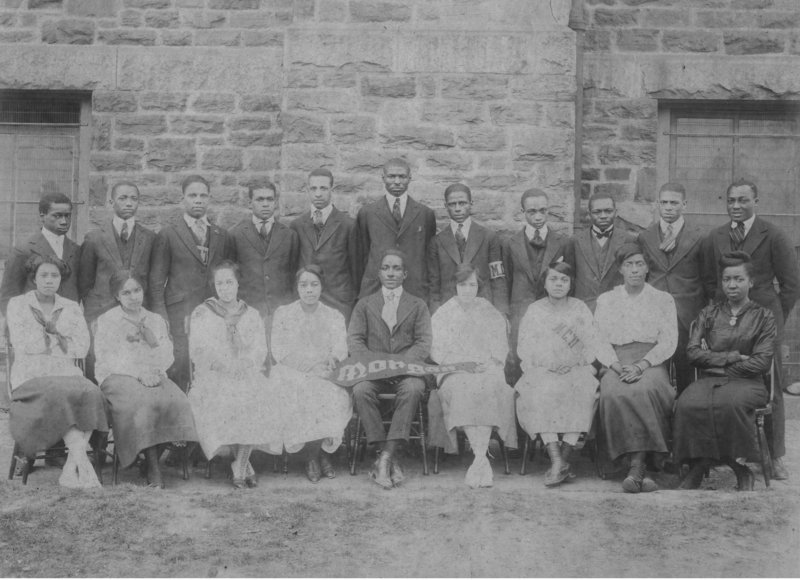 Both Mr. Trent and Dr. Walker’s wives were also graduates of Shaw. Ernest McKissick attended Shaw with the help of Mr. Trent and Dr. Walker. His son Floyd McKissick later attended Morehouse College and enrolled at North Carolina College (NCC) Law School, later North Carolina Central University, but he also successfully sued for admission to UNC Law School and became the first black student to be admitted there. Many graduates of all-black Stephens-Lee High School went on to attend HBCU, including Dr. Frank O. Richards, a Stephens-Lee High School graduate who received his medical degree from Howard University. 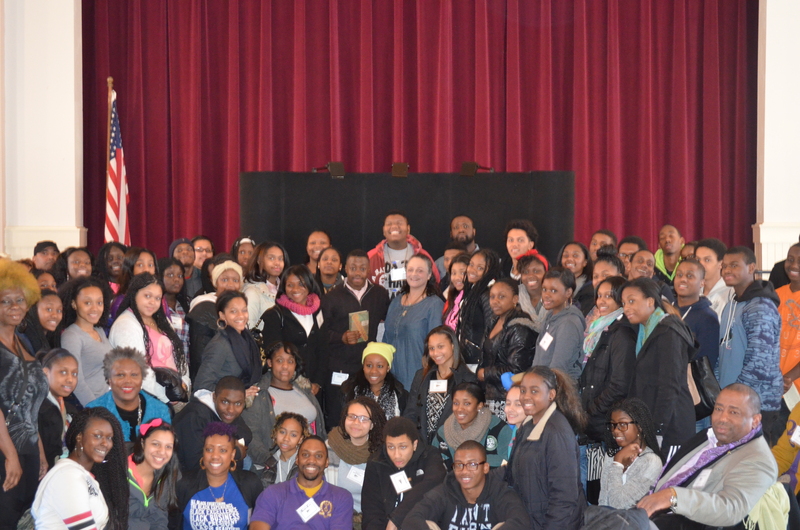 About a dozen students from Stephens-Lee High formed the Asheville Student Congress on Racial Equality (A-SCORE). Mr. Marvin Chambers, A-SCORE founding member and community leader, pursued his engineering degree from North Carolina A&T, and said he wouldn’t trade the experience and education he received there for a million dollars. Attorney James E. Fergusen, II, another A-SCORE founding member, later went on to become student body president at North Carolina Central University. Many of Asheville’s current leaders include graduates from HBCU. My own family history includes several members who attended HBCU including the siblings of my great great great grandmother, Mary Jane Jamison Mason. Her sister, Sally Jamison Malone, attended Walden University, a historically black college in Nasheville, TN before moving to Topeka, KS where she ran a Florence Crittenden Home for Unwed Mothers. 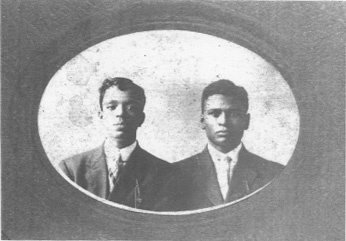 Their brother, Dr. James Monroe Jamison, was part of the first graduating class from Meharry Medical College, the first medical school in the South for African Americans. My great great grandfather Reginald W. Stewart attended Lincoln University. My great grandmother Addie Jane Johnson Stewart graduated from Morgan College (now Morgan State University) in 1917. She later taught one of her neighbors to read. I am sure that in many cases, people came home from HBCU and their education and leadership experiences caused a ripple of positive change around them as they served as role models, educators, and professionals in their communities. I had something particularly special to share with this group of visiting students and Omega Psi Phi fraternity members. 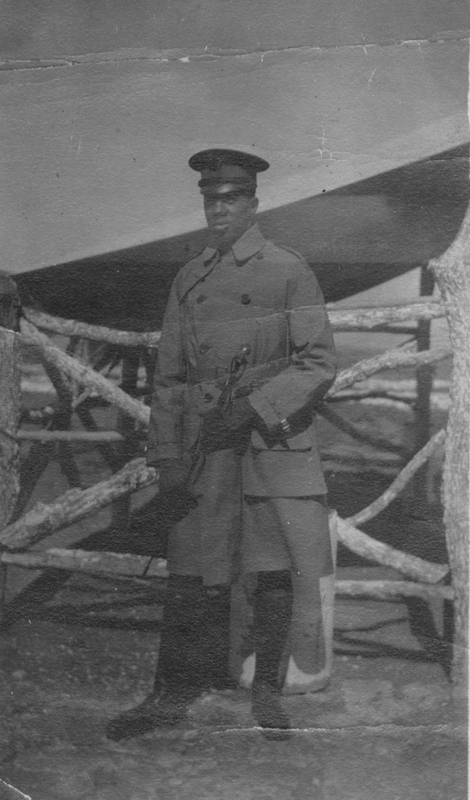 In one of our old family photo albums, my great grandfather Samuel Stewart had included photos of his friend Nathaniel Burrell, with whom he served in the US Army during World War I. In researching Mr. Burrell’s life (wondering if he might have been some relation), I learned that Nathaniel Burrell went on to become a charter member of Omega Psi Phi’s Xi Phi Chapter in New York City. In researching HBCU in preparation for the students’ visit, I found an article from the LA times that said black students attending a four year HBCU have a 70% graduation rate, versus 30% for black students at predominantly white colleges. Some other benefits include being surrounded by black achievers and leaders, no longer being a minority in the school community, smaller class sizes, diverse curriculum, caring staff, role models, continuing the legacy of HBCU, lack of discrimination. Of course, many HBCU struggle with funding and with keeping costs down, so students have to weigh their needs against what each school has to offer. Choosing a college is a very personal choice influenced by many factors, but I hope that the students come through this journey feeling inspired and encouraged to continue the legacy of HBCU. The White House just released its first class of HBCU All Stars: 75 undergraduate, graduate and professional students for their accomplishments in academics, leadership and civic engagement. Hopefully these colleges will remain strong and healthy, fostering the growth of the next generation of leaders. Wherever their paths lead, I asked the students visiting us today to remain life-long learners: to read, to find their own gifts, and then find ways to give back to their communities. This entry was posted in Community, History on February 17, 2014 by Sasha Mitchell. A Valentine for E. W. Pearson, Sr. Please read this wonderful post about E. W. Pearson from Pack Library’s blog, HeardTell. Sharing artifacts of Pearson’s life, among many entertaining and engaging stories about the people of Asheville and Western North Carolina, this blog is bound to get you excited about history. If you haven’t been to the North Carolina room, please visit sometime. We are lucky to have this resource right in our community! This entry was posted in History on February 12, 2014 by Sasha Mitchell.